You may be familiar with artist Jen Dixon‘s big, bold abstract paintings. In contrast to these, her pen and ink drawings are more controlled and full of serene, hard lines. 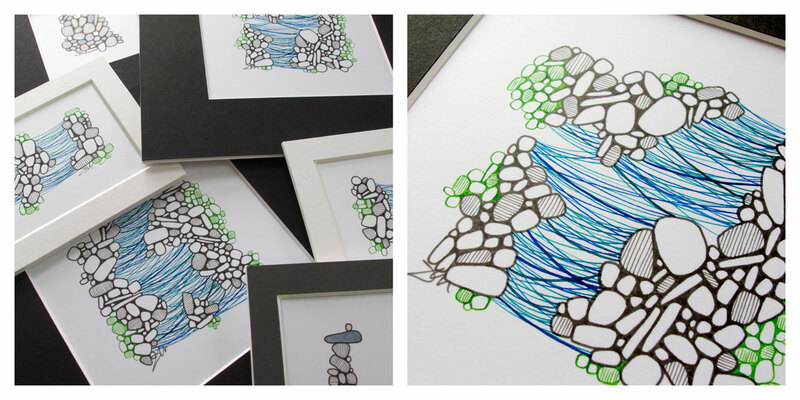 She has recently finished a series of drawings she calls “Waterwebs” – inspired by the stones on her local beach, that are available in her web store. 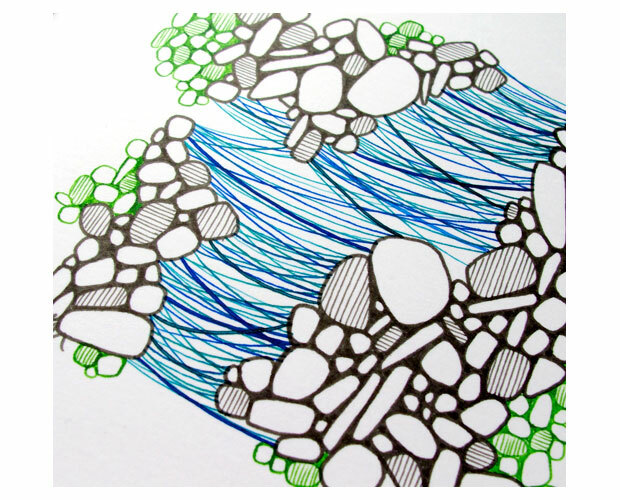 The drawings are made using a combination of dip pens and felt tip pens on Bristol board. Jen is a fan of Zest-it for her oil painting, as you will read, and in this article she tells us what happened when she tried Zest-it Pen Nib Cleaner for her drawing tools. I’m going to come out and say it from the start: I’m a big fan of Zest-it. I buy the Zest-it Solvent in 5 litre jugs and it has become a vital part of my oil painting process. With this in mind, I decided to try Zest-it Dip Pen Nib Cleaner for illustration pen cleanup. If you’re not familiar with Zest-it, let me give you some reasons to try it: It’s non-toxic and not an eye or skin irritant. It’s safe to breathe (which is wonderful if you’ve got asthma or work in an enclosed space). It’s pH neutral, has no CFCs or other environmentally nasty things that are best avoided. It can replace your reliance on turps and white spirit. Oh, and the original formula Zest-it Oil Paint Dilutant and Brush Cleaner smells like oranges, so that’s nice. How does the nib cleaner stack up? Great. Really great. I let a handful of nibs get dirty and dry, using a variety of inks (India, calligraphy, writing) to put the pot to the test. 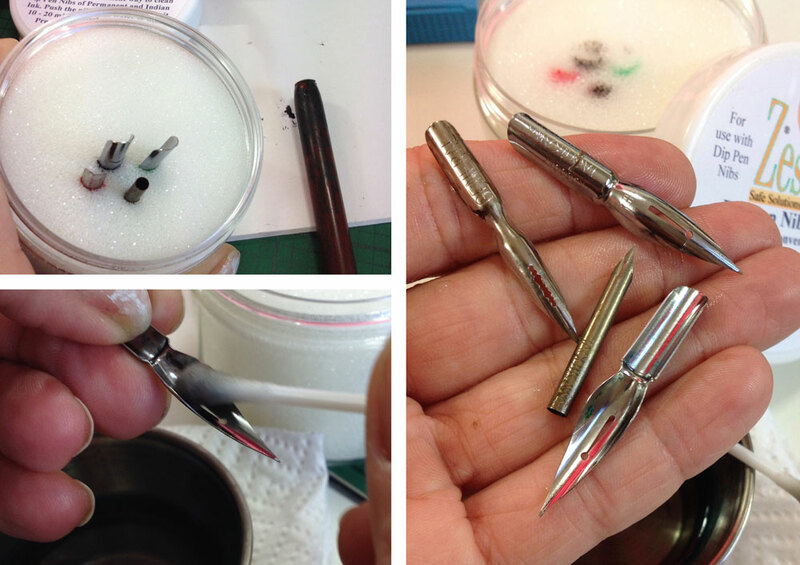 In the past, I cleaned nibs by soaking them in soapy water, scrub with a toothbrush, and repeated until useable. I have been known to scrape off stubborn ink with my fingernails. It was a time-consuming and flawed process. ready to put the Zest-it Pen Nib Cleaner to the test. Zest-it say to push the nibs into their sponge pot, leave them 10 – 20 minutes, then rinse and dry. Even with my enthusiastic faith in the brand, I thought it couldn’t be that easy. I was wrong. 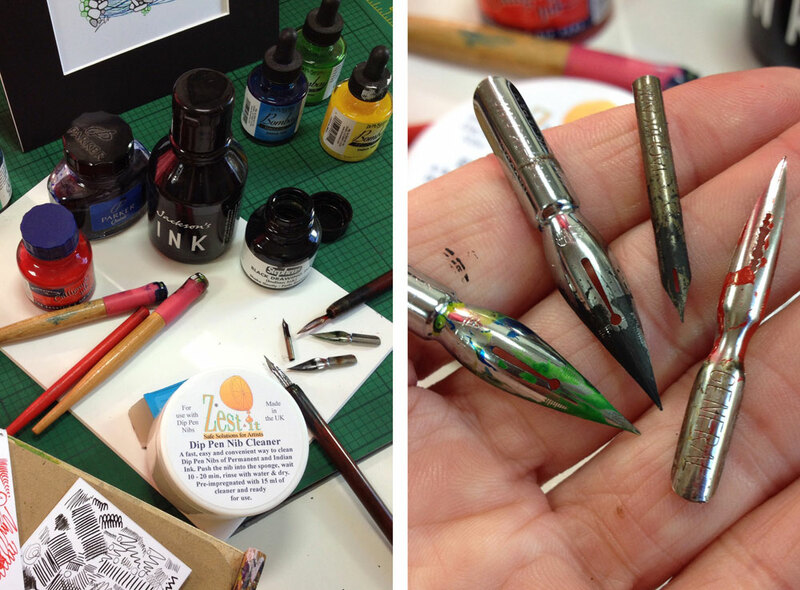 Jenn Dixon’s drawing pen nibs after a short soak in Zest it and a quick wipe. If you use dip pens in your work, you need this. Let the Zest-it do the work while you go have a cup of tea or check your email. By the time you come back, your nibs will be ready to dirty up all over again. Less time cleaning up, more time creating. How can that be a bad thing? Internationally-selling artist, Jen Dixon works mostly in mixed media abstract and figurative painting. She is also an illustrator, writer, and teaches life drawing. Originally from Indiana, she is an American and British citizen, living on the North Cornwall coast of the UK.